This falls is not high, but it's absolutely beautiful and accessible via a fairly easy hike. A shallow cascade suddenly drops off a ledge in a free-fall a little wider than it is high, with most of the water coming down on the right side looking up. The water drops onto a flat rock and slides right into a huge, round, tea-colored pool. The pool makes a fantastic swimming hole and you can walk behind the falls relatively safely. A great one for the whole family to visit! 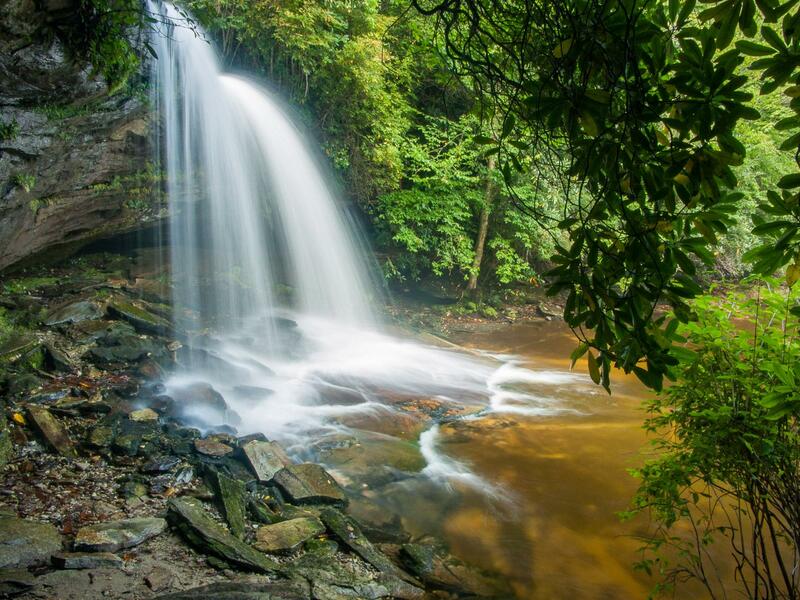 This waterfall is a photographer's dream - there are so many possibilities here. From Brevard, follow US 64 West for about 15 miles (it becomes very curvy) to the intersection with NC 281. Turn right. Go 0.8 miles and turn left on Cold Mountain Road (a fire station is on the right). Proceed just under 6 miles up Cold Mountain Road; the road turns to gravel. At a sharp left turn, a sign will indicate the Panthertown parking is just ahead. It is 0.1 mile from the sharp left turn to a gravel road on the right signed for the parking area; the road is about 0.1 mile long and the parking area is just a wide spot at the end of the road near the powerlines. From the parking area, take the Panthertown Valley trail. It's on the right (northwest) as you drive in. This mostly smooth trail goes uphill a bit, then starts downhill before ending at the old Cold Mtn. Road in less than 0.2 mi., just past a foot bridge. Turn left. This old gravel road descends gently for 0.9 mi, through some switchbacks, to an intersection with the Devil's Elbow trail on the right. (Avoid any footpaths leading off the old road). Go straight, across a new bridge. You'll reach the intersection with the Little Green trail in less than 300 ft., on the left. Turn left here and go just under 0.2 mi. This is a slightly uphill path with some wood structures (which keep your feet dry), and it ends at a split. The trail to the right ascends Little Green Mtn. ; go left about 100 ft. to a great viewing area of the falls - on a gravel bar at the far end of the big plunge pool.